I was recently dragged to see the Tony-award-winning play Oslo at the Harold Pinter Theater in London. 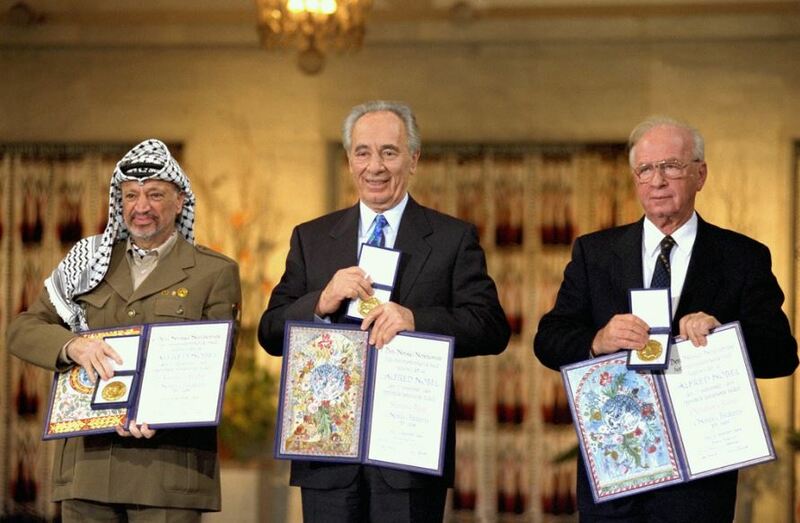 It portrays the back-channel negotiations that produced the Oslo Accords, the 1993 agreement struck between the Palestine Liberation Organization (PLO) and the state of Israel. I really didn’t want to go. Friends who had already seen it confirmed the impression I got from reviews: “It’s not for us,” one of them said. I expected to be disappointed. But what really struck me about Oslo was what it actually seeks to achieve: an earnest and unfazed rehashing of the Oslo negotiating formula. That formula is to assume parity between the occupier and the occupied and treat both as equal. Basically: advocate that “the wolf will live with the lamb.” What Oslo depicts, nearly twenty-five years after the events it dramatizes, is not peace at all. It’s the reverse: an entrenchment of Israeli conquest and mastery. The play is driven by a single-minded preoccupation with diplomatic secrecy, intrigue, and risqué experimentation in conflict resolution. It also employs a strained form of ironic, diplomatic humor and quirky Norwegian-inflected self-congratulations. This whole façade is there to dramatize the notion that it’s more important to get enemies talking than to worry about the outcome of their negotiations. Further, if peace fails, it’s because of ancient enmities rather than the conditions beyond the negotiating table. The play ends with a short, labored speech about the heroic frontiers of peace-making and the rewards that lie across the horizon. What it wants to tell the audience is this: the only way to solve the Palestinian-Israeli conflict is to put the two parties together in one room and force them to talk to each other, develop personal relations and trust, then compromise. This sounds benign. But the reality is that if you put unequal parties in one room together, you will get an outcome that reflects their fundamental inequality. The powerful side will force the weaker side, who has no real leverage and no objective protection, to undertake one concession after another. The ploy of Oslo is to rehash this disastrous political formula, wherein the Palestinians have no external political protection and that their fate is in the hands of their occupiers. What is clear from Oslo is that this is exactly what Israel wants (America only makes sure it gets it at the end). Israel’s condition for negotiations is that the Palestinians leave aside the international laws, conventions, and UN resolutions that safeguard their rights as an occupied people and come and talk peace “without any preconditions” (as if international law is a constricting precondition rather than a mechanism for conflict resolution). What this creates is a structure in which the weaker side has already conceded all its core rights, even before it starts negotiating. What remains are the details of hammering out the exact terms of surrender. Once the PLO locked itself into this framework, there was little it could do to change the inevitable outcome of becoming an active instrument in Israel’s occupation regime — which is what the PLO has become for nearly longer than it was a national liberation movement. This is why one can’t help but feel that there is something buffoonish about the two Palestinian negotiators in the play (both, incidentally, called “terrorists”). One of them sounds like a Soviet demagogue, while the other’s anglicized Arab charm doubles up as empty vanity. Both overdramatize their rejections and red lines only in order to capitulate more firmly at the end. Even as they accept Israeli sovereignty over all Palestinian territories, they celebrate control of the small town of Jericho (in addition to the 2 percent of Palestine which is Gaza). In such closed rooms, peanuts become real achievements. I won’t bore the reader with details about the stale tropes of Oslo peace-making: the savvy Israeli New York lawyer with a knack for legal lists and details or the empty rehashing of Israeli foreign minister Shimon Peres’s mythical desire for political compromise. What is clear is that the personal trust that develops between the brashly depicted (and overplayed) chief negotiators Uri Savir and Ahmad Qurei doesn’t change the fundamental nature of their encounter. Palestinian negotiators freely walked into a trap of Israel’s making — with Norwegian compliments. The real potential damage of Oslo is that it aims to push those who are still interested in peace back into dead rooms and unjust formulas. We need new plays. Ones that instill the hope that Israel’s colonial mastery, brimming with daily cruelty, will soon end.